Following an analysis of academic challenges students faced in developmental math and the College Algebra course, the math faculty worked with EdPlus’ educational technology experts to develop a new solution that changed the way ASU teaches the course. First, the faculty decided to eliminate the developmental math course. This was due to the fact that while students may do well in the course, they were also more likely to fall behind in their degree program and drop out of the university at a higher rate than other students. The developmental math course was designed for students who needed College Algebra for their degree program, but did not score high enough on their math placement test to enroll directly into the course. Data also showed that how a student performed in developmental math offered no demonstrable benefit in their College Algebra course outcomes. Second, faculty recommended the implementation of an adaptive learning math program. Adaptive learning courseware delivers instructional resources and assessment activities to help students master the learning objective of each lesson. The systems collect data on student progress and performance and provide a recommendation on the lesson or content selected to help each student learn as effectively and efficiently as possible. After analyzing several adaptive courseware systems, ASU selected and configured McGraw Hill Education’s ALEKS platform for use by all students enrolled in the class. Douglas Williams, principal lecturer in the School of Mathematical and Statistical Sciences, believes the changes made within the College Algebra course, along with the implementation of ALEKS, provided faculty with new instructional methods that require students to learn and master the material rather than just memorize. Finally, the faculty created the flexibility of a “stretch” semester, which gives students the ability to continue working their way through the curriculum into a second semester if they were not able to finish it within one. Since the implementation of these changes in fall 2016, ASU has achieved a 20 percent increase in the student success rate when compared to previous years. This translated into an additional 800 students passing the course in the first year. 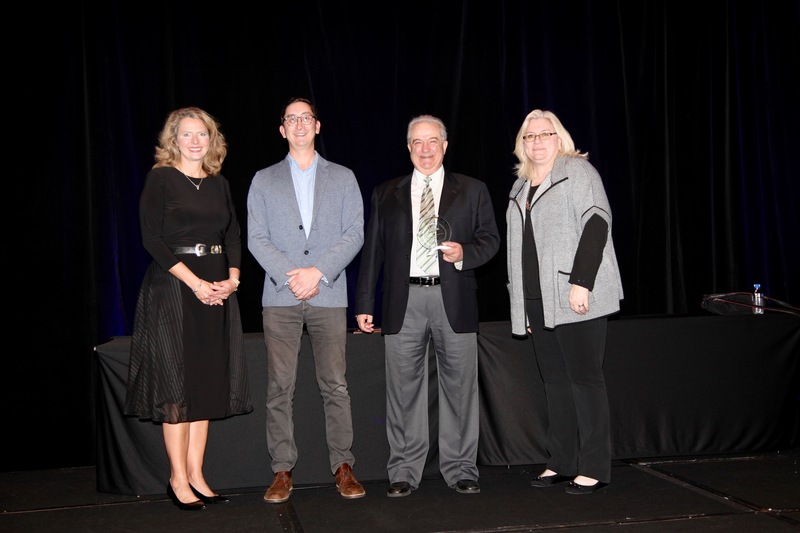 “Our increased student success in College Algebra is a great example of how adaptive technology can meet individual learning needs at scale,” Johnson said. Then, about a month before she was set to move from her hometown in Michigan, she learned she was pregnant. She made the move anyway. Wallen-Balmir says her experience at the university was great but admits it was a hard, long journey. She was a single mother raising her daughter, Selena, while working to balance a full-time course load and a full-time job. Her journey is one that includes pivotal points of support from individuals in the Sun Devil community. Like the moment in her first year on campus when she realized she needed financial support. An employee at the university’s financial aid office helped connect Wallen-Balmir with additional grants and scholarships. 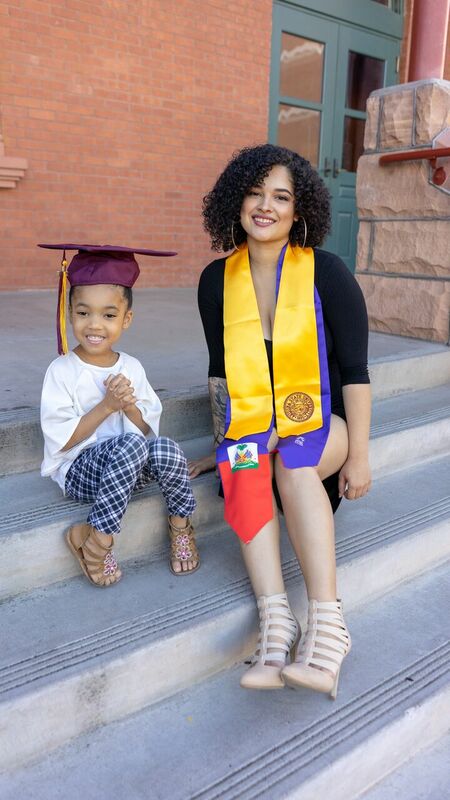 In preparation for graduation from the Hugh Downs School of Communication this December, Wallen-Balmir had graduation photos taken and included Selena, now 3 years old, in the photoshoot. “We did this together. I have had to take proctored exams with her crying. I’ve had to do homework and have her fall asleep in my lap. We’ve fallen asleep with a textbook open next to our faces. A lot of people won’t understand that but it’s a journey we did together,” she said. Wallen-Balmir wants people facing hard times to keep pushing toward their dreams and always remember to not give up. Wallen-Balmir answered questions about her experience at ASU and shared what’s next in her journey. Answer: I was a math major — I’ve always been good at math — and as the years went on, I took more math classes but I was really just taking them to take them and I wasn't enjoying them. I did some research to see what I could do with communication and there are so many careers you can go into with a communication degree. I sat down with my academic advisor and she helped me get on the path to a communication degree. Also, a lot of the communication classes are offered online. I thought that was perfect for me since I’m a single mom and work full time, so it was very convenient. I enjoy these classes; All the things I learn in my communication classes I actually apply to my work so it makes my living and work experience better. I’ve been working, learning and applying at the same time. A: A lot of people’s perception of college, in general, is that you pay for the classes, you do it and that’s it — you don’t really have a relationship with your teachers because classes are so big. But the professors in communication show that they care. My instructor now, Ashley Wheeler, is awesome; she’s amazing. She actually let me take my daughter to class one time because I couldn’t find a babysitter. That means the world to me because a lot of professors may be like, "You just have to take the absence and catch up later." I had expressed how important it was not to miss class and she said "I know things happen, go ahead and bring her." It was a really good moment for me to see that she cared about my education and made arrangements for me to be able to come to class. The thing I learned was that professors don’t just come to college to get a check. They actually care about you succeeding in life and that motivates me not to give up. A: Professor Lank, in my UNI 220 academic refresher class. She didn’t look at us like we were flunking out of college or just not caring about our grades. She took the time to learn what was going on in our personal situations, why we thought we got to the point to where we had to take an academic refresher class. It wasn’t necessarily just one specific thing she taught, she just taught me that people go through things. Things happen and that doesn’t mean you’re not a good person or that you’re not doing all you can do to succeed. She gave me — and I’m pretty sure the rest of the class — the motivation to go back uphill. A: Take some time for yourself. Definitely still study throughout the week but take time for yourself on the weekends. If you don’t, you won't be able to focus on your studies. A: Given that I am interested in law, I would invest in representation for those who can’t represent themselves. There are so many people in this world being convicted of crimes they didn’t commit. I would start funding and helping provide good representation. Q: What organizations were you involved in? A: The Black Undergraduate Law Society has given me so many connections. That organization is great. I was able to attend the Arizona State Bar, I was able to meet Professor Myles Link. … They give you so many resources for your career and academic life. A: I am 100 percent taking a year off. I have dedicated the last four years and some to school. My daughter has grown so much and I missed the little things. I want to sit back and breathe and be able to be at home with her — go to work, come home, eat some pizza, watch a movie — just relax. During the year, I am going to study for my LSAT because I want to get the best score possible. So, I’ll be taking the next year off of school, but I guess not taking the year off of studying. It’s what I have to do to get where I want to go.